English Premier League stalwarts Everton Football Club have been looking good in Umbro kits since signing with the Manchester, UK soccer specialists in 2014. This is our World Exclusive in-person, up-close look at the very popular Toffees’ 2018/19 third kit that has joined EFC’s latest home and away jerseys in their latest match range. 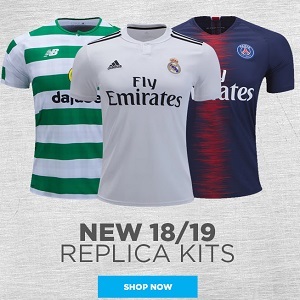 Umbro’s online store, World Soccer Shop, Kitbag, Subside Sports, Lovell Soccer, Pro:Direct Soccer and UK Soccer Shop all currently have the Everton FC 2018/19 Umbro third kit on sale. 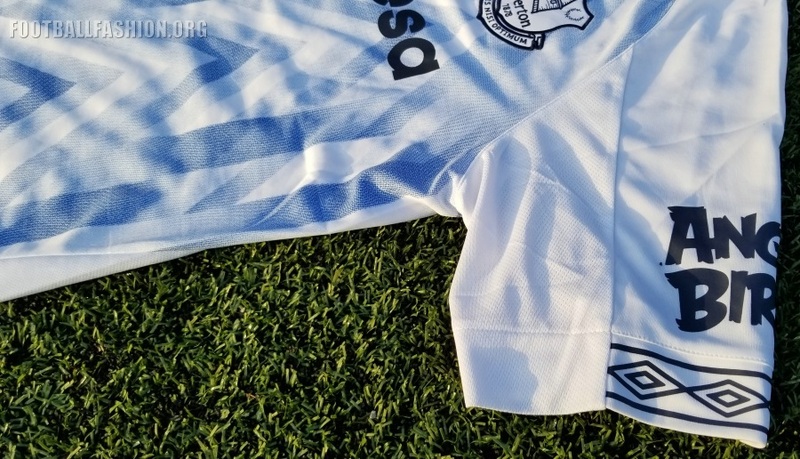 White change kits have long been part of Everton’s tradition dating back to their 1902/03 away shirt. In recent times the color has been used for the team’s alternate and third jerseys along with yellow and purple. 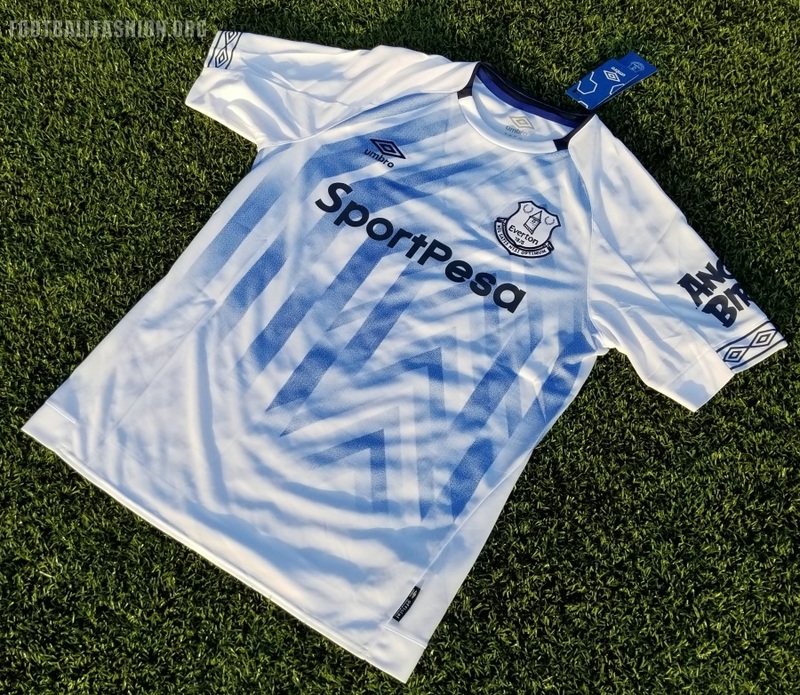 The Everton 18/19 third kit is the latest from the Merseyside team to have a white base and continues a three-year run in the color for Toffees shirts. A mainly white Everton crest with navy blue badge elements such as the club name, year of founding and motto is embroidered on the left breast. The choice of colorway works well with the rest of the shirt while adding a classy element to the modern-vibed kits. As arguably Umbro’s biggest Premier League club and the one expected to achieve the most success this season, Everton has received a brilliant, bespoke design for its 2018/19 third kit. While third kits have often become commercial afterthoughts for other sportswear firms, Umbro has delved into The Toffees’ history while incorporating the modern for the Everton 18/19 third kit. At its core the shirt is an eye-catching crewneck affair with a collar that has a smooth polyester front and ribbed back section. A clever stitching pattern connects it to the shoulder area. Its front is silky polyester while its back is lighter and ventilated for sweat dissipation. Similar ventilated fabric is used of the underarms. 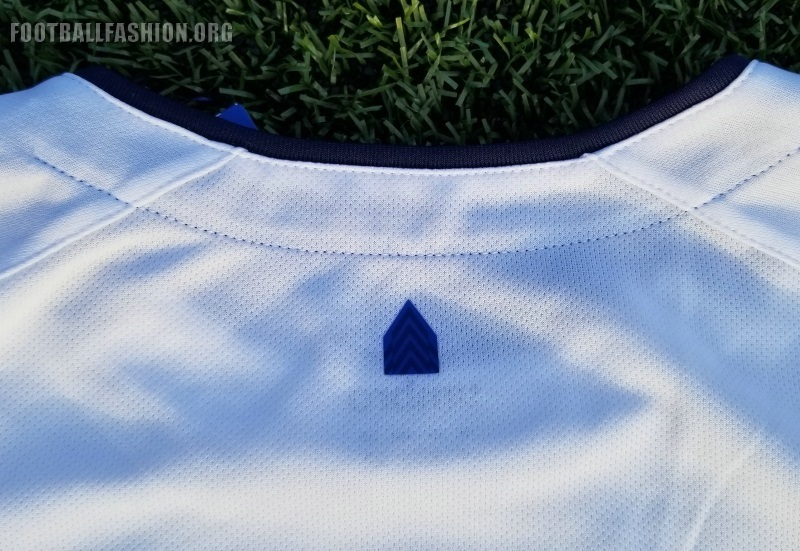 Lastly, the back waistline uses the same material as the front of the kit for a nice standout effect even though it is in the same shade of white as the rest of the jersey’s back. 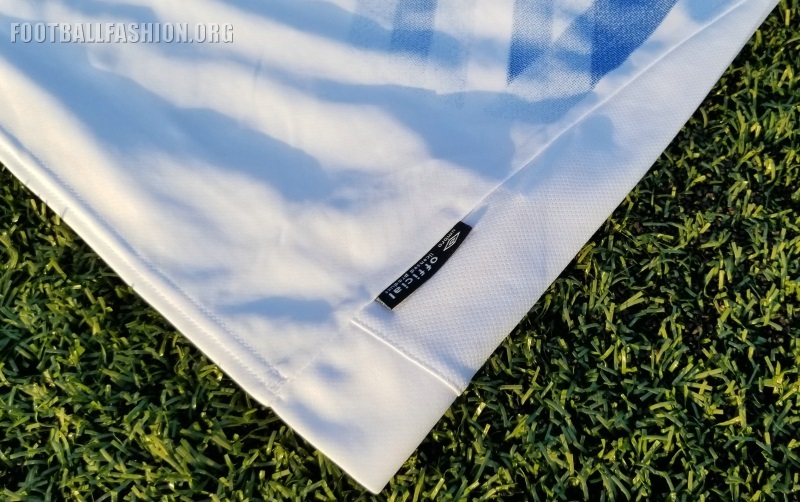 Things get brilliant with the detailing on the Everton 2018/19 third kit. The most obvious is the large graphic of Prince Rupert’s tower (taken from the team’s crest) on most of the shirt’s front. The artwork is such that the tower is stylized into a series of modern geometric shapes with a perhaps tattoo-inspired shadow effect. This is one of the best kit graphics that we’ve seen in some time and is something that Everton and Umbro could probably make an entire collection out of. A small screen-printed representation of the tower also appears on the outside upper back of the kit. Umbro’s iconic diamonds are printed in navy blue on three quarters of each sleeve cuff to create a look reminiscent of the firm’s diamond taping found on 1990s soccer jerseys and shorts. The color of the diamonds matches the embroidered one on the right breast and rear inside neckline. A strip of Everton’s primary royal blue also appears on inner neck area. 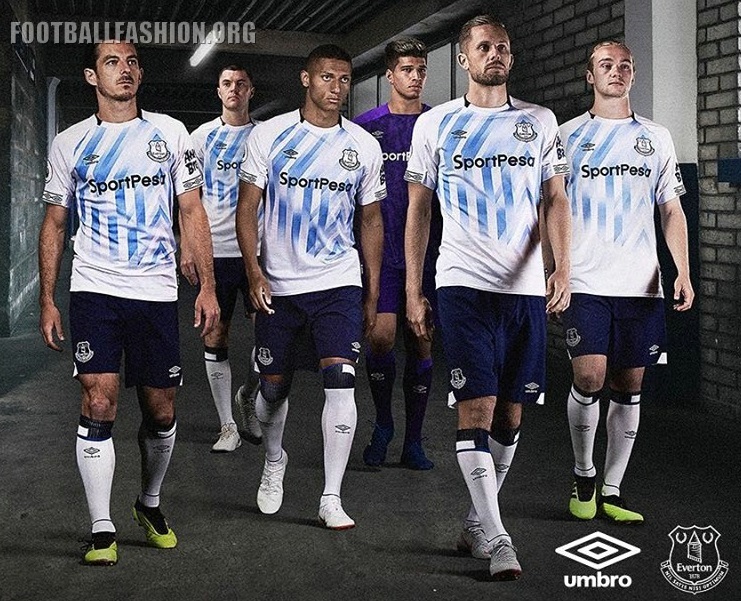 The shirt sponsor logos on the Everton 18/19 third shirt are also navy blue. The Sportpesa branding on the front is relative small and not obtrusive. The Angry Birds logo on the sleeve is bigger than we expected. While we are not fans of the Premier League allowing sleeve sponsors this one isn’t that bad since it belongs to a popular, trendy app as opposed to a line tire company or money transfer firm. The Everton FC 2018/19 Umbro third kit is a true to size fitting shirt. 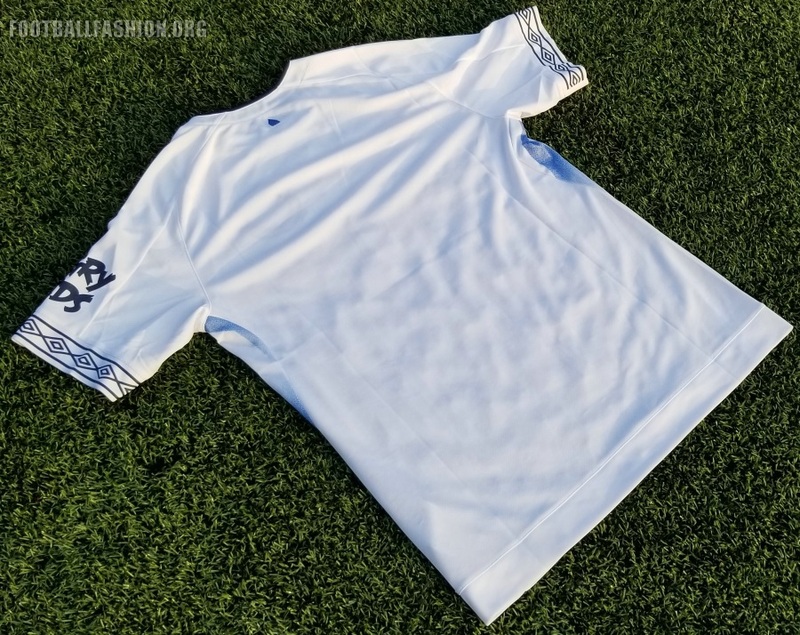 Like so many of today’s soccer jersey it does carry a slimmer fit that will show off the good and the bad in your build. If you’re not particular well-built then we suggest going a size up. Those of use with physiques forged in the gym and the football pitch will love wearing this jersey to show off the fruits of our labor. The materials from which the kit is made are extremely lightweight. Add in the ventilation on the back and underarms and you’ve got an extremely comfortable shirt that is ideal for warmer temperatures. Another excellent bespoke piece from Umbro, Everton’s 2018/19 third kit ranks among the best of the ongoing season. It looks much better in person as only them can you appreciate its intricacies. This jersey is a worthy addition to any football shirt collection.